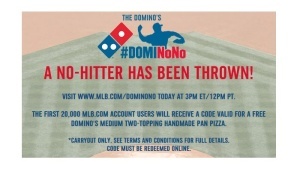 Dominos has teamed up with the MLB to give out free pizzas the Monday following a no hitter. The Cubs Jake Arrieta threw a no hitter against the Dodgers last night making today the day for free Dominos Pizza. Follow the steps that are listed and be sure to get on at 3 PM est time to request one of the 20,000 pizzas that will be available. These will go fast, so be sure that you have your MLB account set up and ready to go by 3 PM EST to get your free pizza. Dominos has been recreating their pizzas to what is now a pretty good pizza. If it has been a while since you’ve had Dominos then tonight is a good night to try them again.